"The love animals can give is boundless." 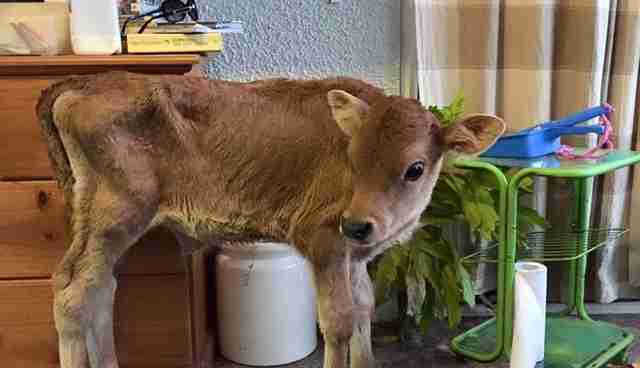 The calf was in bad shape when Kelly Nelder found him. He was weak and listless, and severely underweight. When Nelder approached the calf in his dirt pen, he barely lifted his head. 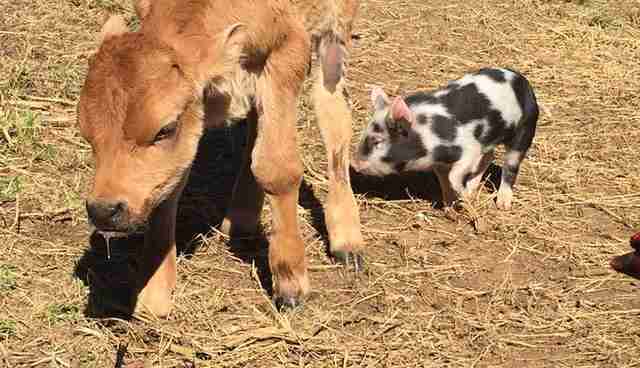 The calf had been born on a dairy farm in New South Wales, Australia. Male calves are viewed as "waste products" of the dairy industry. After their mothers give birth, the male babies are sent to slaughter so their mothers' milk can be used for human consumption. 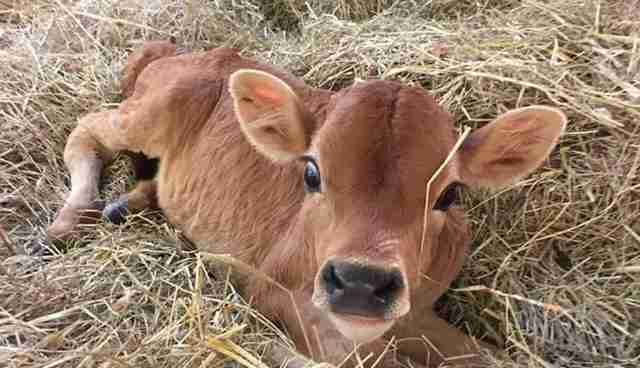 When a woman living in Sydney heard about the calf, she offered to adopt him. The woman's intentions were good, but she didn't know how to feed a calf, and the baby lost weight when he should have been gaining it. 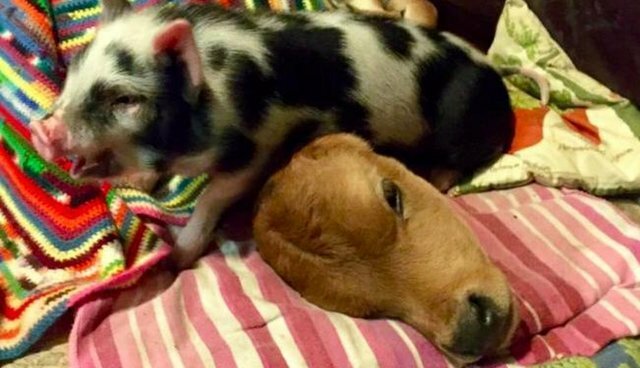 Nelder, who founded Sugarshine Farm Sanctuary near Lismore, Australia, arrived at the woman's suburban property to pick up three pigs, including a piglet Nelder named Baby. 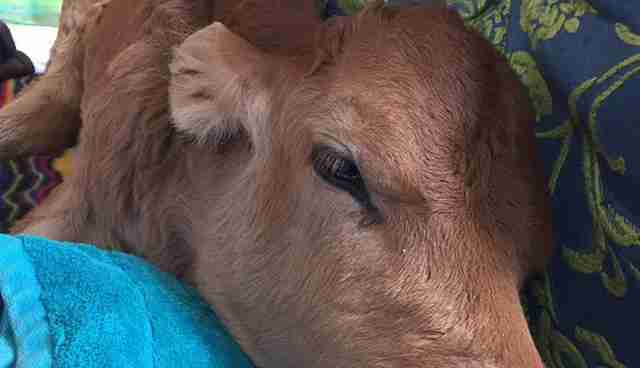 When Nelder stepped into the woman's backyard, she spotted the baby cow. "He was alone in the dirt pen," Nelder tells The Dodo. "I was shocked when we were told he was 4 weeks old, because he looked much younger." 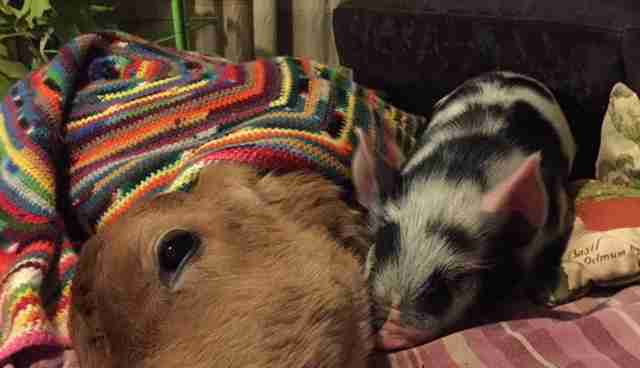 The woman agreed to give the calf to Nelder, along with her three pigs. Nelder loaded the animals in her battered two-door Toyota Echo and drove them back to the sanctuary. The calf was so small, he just rode in the backseat. Earlier that day, Nelder had attended a funeral of her beloved grandmother Bunny, so Nelder named the calf "Bunny" after her. Instead of putting Bunny into an outside pen, Nelder took him inside her house. "Bunny was very sick," Nelder says. 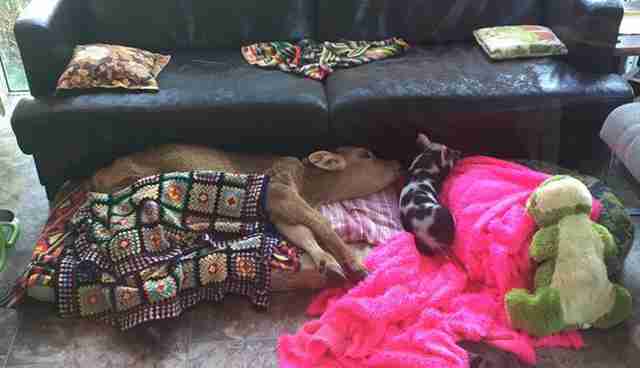 "He slept on a little mattress inside the sunroom, but he was very uncomfortable. He was weak and in pain, and he couldn't settle." 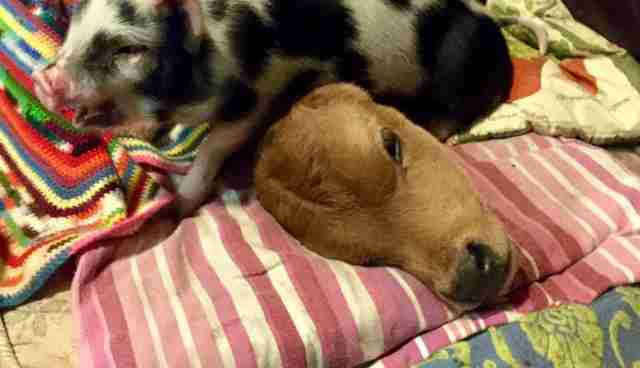 Nelder tried to keep Bunny isolated, but Baby the piglet had other ideas. "I was going into the sunroom to feed Bunny when Baby trotted in and began nuzzling Bunny's face and climbing around him," says Nelder. "We told Baby to shoo because Bunny was too sick to play, and I popped Baby outside the room. While I had my hands full feeding Bunny, Baby pushed the sliding door open with her snout and ran in and jumped on the mattress." Nelder tried to push Baby away again, but she noticed Bunny snuggle into Baby like a pillow. Nelder was surprised - the animals had come from the same property, but they'd been kept in separate pens and hadn't met until now. Yet Bunny and Baby acted like old friends, and Bunny seemed to relax for the first time since he'd arrived at Sugarshine. Even with Baby's company, Bunny's health continued to deteriorate. His nose started to run and he had difficulties breathing. Nelder rushed Bunny to the vet, and she got some bad news: Bunny had pneumonia, and the vet thought the only option was euthanasia. Nelder, however, thought Bunny still had a chance. She got him a prescription for antibiotics along with hydration medication, and took him back to Sugarshine. Bunny improved for about 24 hours, but then he went downhill again. "He was so weak, he couldn't hold his head up," says Nelder. "I had to hold his head up with one hand and put a syringe in his mouth with the other. I'd wait until he'd swallow, but sometimes he was too weak to swallow. He wasn't able to stand to go to the toilet, which distressed him a lot, so I'd have to hold him up so he could go." Then Bunny started to have seizures. Really bad seizures. His eyes rolled back into his head and his neck arched back. "It was a truly awful experience," Nelder says. "I tried to get the on-call vet to come euthanize him, but he was caught up elsewhere." Baby stayed by her best friend's side the whole time. 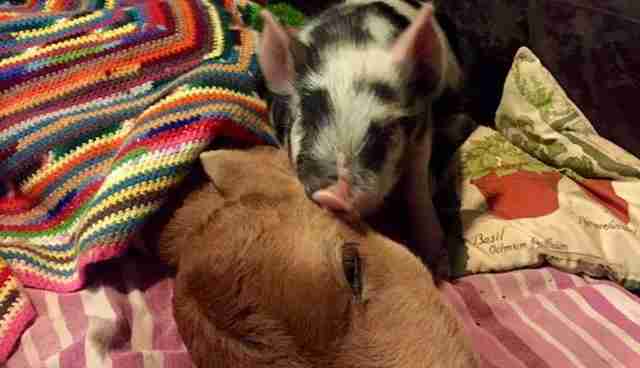 "After the seizures, Baby would snuggle up to Bunny and soothe him." After an exhausting and tearful night, Nelder called the vet again to see if he could euthanize Bunny, but something extraordinary happened. "As I was on the phone with the vet nurse, I noticed Baby dancing around Bunny's face," Nelder says. "Bunny had his head up and his eyes were open. This sounds unbelievable, but it's true! I told the vet I'd call him back." Slowly but surely, Bunny started using his legs when Nelder helped him up to go to the bathroom. Then Bunny started taking steps on his own. Whenever Bunny fell down, Baby would dash over to him. Bunny has joint issues after his bout of pneumonia, and he's needed ongoing pain relief and antibiotics. 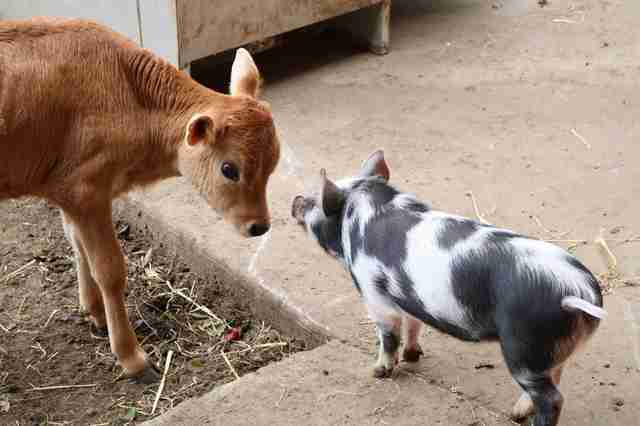 But he's a different calf now - playful, curious and loves to skip around the animal sanctuary with his best friend, Baby. He also moos loudly for his breakfast, and likes soaking in the afternoon sun. 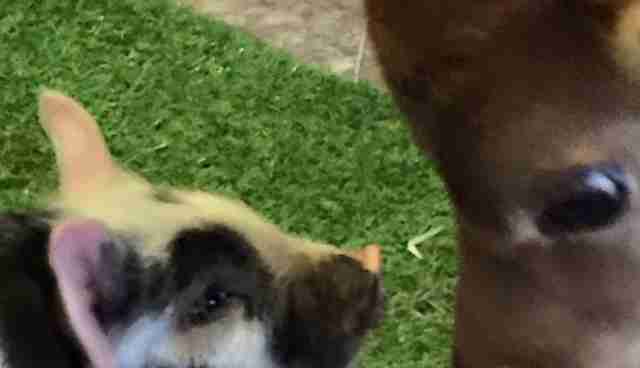 "I believe that the love and affection and confident spirit that Baby Piglet shared with Bunny absolutely made a difference to his recovery," says Nelder. "Probably a life or death difference. Seeing Bunny and Baby happy and healthy together remind me that the world is a beautiful place, and that the love animals can give is boundless." Sugarshine Farm Sanctuary is an animal haven in New South Wales, Australia, that approaches animal rescue in a non-judgmental way. They believe animals need love, affection, mental health and joy, as much as they need food, water and shelter. 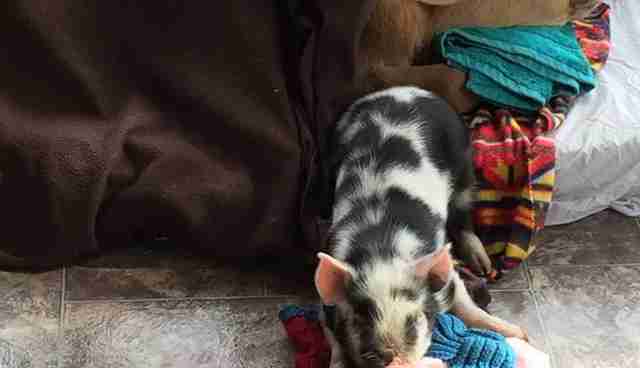 To help Sugarshine help animals like Bunny and Baby, you can donate here. You can also get updates on Bunny and Baby by following Sugarshine's Facebook page.